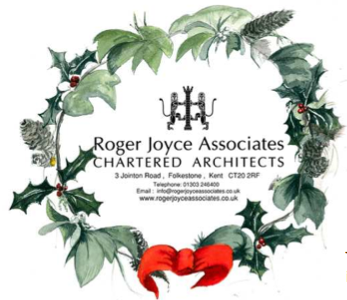 Merry Christmas from the team at Roger Joyce Associates! It's now two years since we started working from home, and life continues to be busy and interesting. We're still mentoring Marc, who may now defer his part III until next year. He's displaying real stamina and determination to get to that finishing line! Roger continues outside interests on the Boards of Town Centre Management and The Dreamland Trust, and actively works with the Heritage Arts and Tourism forum that will contribute to the final Core Strategy when it emerges early in 2013. He has again acted as a Civic Trust assessor, and manages to fit in watercolouring classes somewhere amongst all of that! We've been involved in some fantastic projects in 2012. We carried out inspections of 14 Churches, four of which are for the Diocese of Rochester. Our project for the repair of the lady Chapel at St Eanswythe’s, Folkestone, has hit the buffers, but we hope a solution will be found so that it can restart soon. We are waiting to move the oil tank, to facilitate the construction of a disabled WC at St. Nicholas Newington , and the reordering at St Margaret’s, Bethersden, is slowly moving on. We have carried out extensions for a handful of private houses in Hythe, Folkestone, Canterbury and Margate. These have included the addition of balconies, creation of rooms in the roof, remodelling, and upgrading. We worked closely with English Heritage on the project to take two Martello Towers off the ‘Monuments at Risk’ register. The attendant woodland management of a 15-acre site, where five houses are proposed as enabling development, has been beset with an application for a Town and Village Green registration. 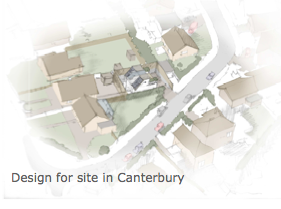 It was fortunately dismissed by KCC, but remains in planning, 19 months after submission of the application! We've always worked on niche and unusual projects and this year was no different. Some of our favourite jobs won in 2012 include a Natural England grant aided barn repair, a feasibility study for Margate’s Tudor House, works to the Grade II* Conquest House in Canterbury, and conversion of a stable range at a former stud between Folkestone and Canterbury. The office will be closed from Friday 21 December 2012 - Wednesday 2 January 2013. When we return in the New Year, we hope that some of the Government initiatives aimed at streamlining the planning system will come into force, and will be effective in cutting time (and therefore costs to our clients) as we move forward. We all wish you a very Merry Christmas!